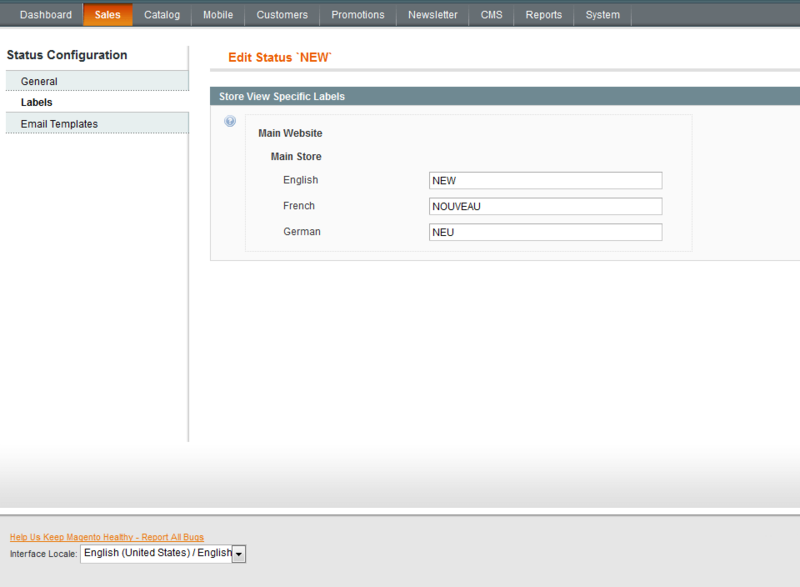 Equip your store with a powerful Magento RMA system. Create numerous custom request types and statuses. Provide visitors with advanced return/exchange opportunities and enhance their shopping experience. Experienced marketers know that an online store should run like a well-oiled machine. Each aspect counts. If your return merchandise authorization system is not customer-friendly or responsive enough you risk losing a good per cent of your clients. With the Magento 1 RMA extension you’ll easily arrange an efficient RMA request process that will definitely bring additional points to your customer service and visibly enhance clients’ satisfaction. An advanced Magento RMA tool helps you constantly keep an eye on your requests history and timely process all incoming queries. On the Request Management grid you’ll be able to quickly find and process any request you need. This handy option will take your Magento 1 Returns management to a new level and help to retain clients. To dramatically increase visitors’ satisfaction offer them easy and clear way of making RMA requests. Let shoppers create and send them even not being logged in with the help of their email and order number. 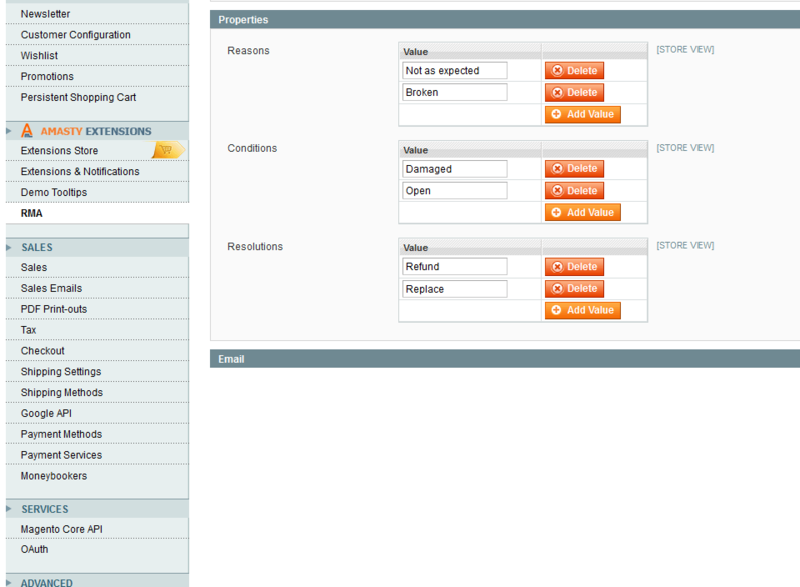 Apart from that now customers can attach additional files to their requests to provide shop admins with more details. 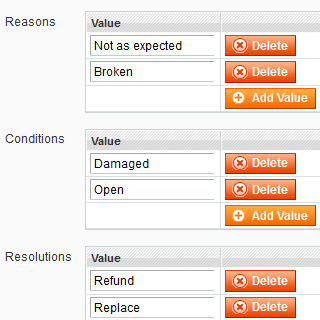 With the magento RMA module tools list one can adjust return and replace process to the needs of each particular store. Due to custom statuses, reasons and resolution types you’ll be able quickly find the RMA requests that need to be urgently resolved. Customers can choose one of numerous reasons for their requests and add a detailed comment.Now you can include any number of fields for storing all the RMA-related information. This option can significantly accelerate all interactions with your clients. Magento refund extension enables you to effectively manage different store views and specify certain options for particular stores. Now your clients will get custom emails created for each paticular store view. 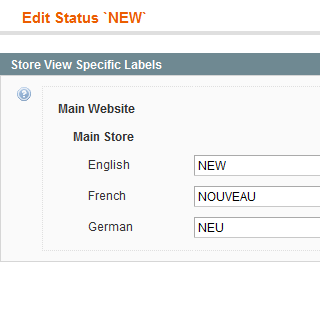 They will also higly appreciate status labels carefully translated for them on their store account page. This easy, but very effective features will dramatically improve customers' experience and bring you more loyal clients. Use Magento product return extension to find out more information about the RMA reasons by letting customers attach additional files to their requests. This handy option will significantly reduce the time spent on request processing, as store admins will get the detailed problem description at once. Can customers attach photos when they submit an RMA request? Yes, there is such a possibility. This way you can give a client an opportunity to prove that your product is faulty if they claim so. 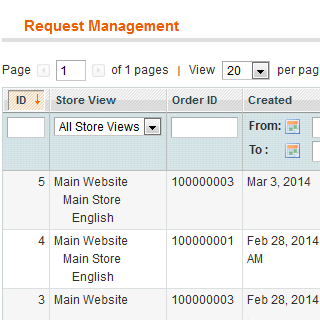 Can an RMA request be created from Magento admin panel? 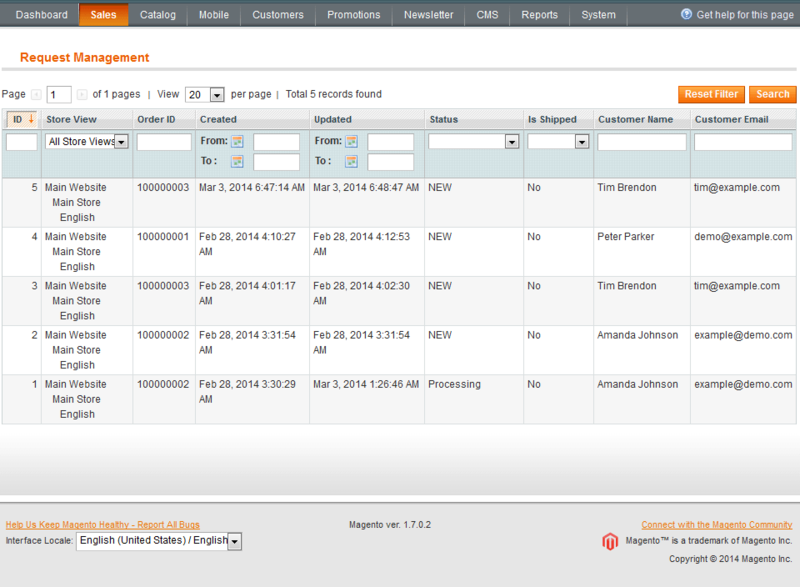 Yes, your managers can create RMA requests like return/exchange opportunities for customers if needed. 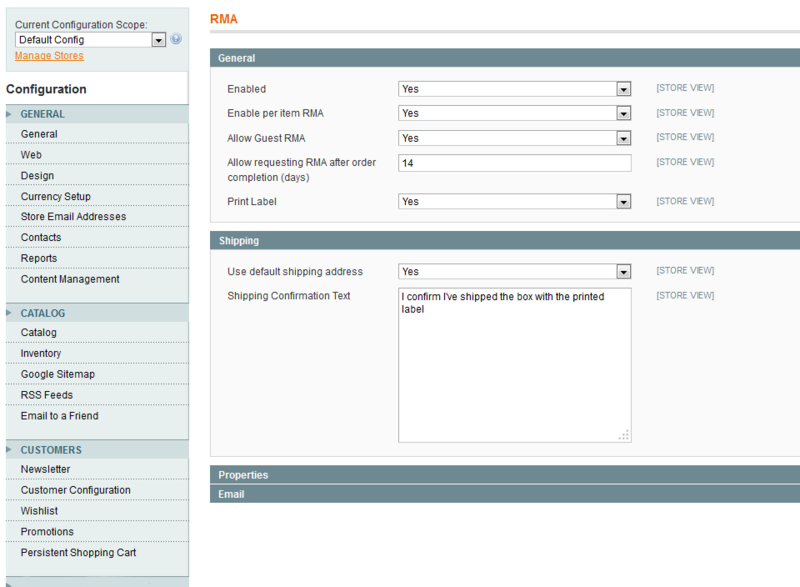 This can be done on the RMA tab found on the order view page. Is it possible to set a different email template for each status change? Yes, templates for each RMA status change can be created and customized through RMA email settings in System > Transactional Emails. There are also ready-to-use templates for you. Is it possible to manage the rma statuses, edit them and add new ones? Yes, sure, since it is the main purpose of this RMA extension. In Sales > RMA > Statuses you are free to edit the existing statuses and create new ones. You can assign an email template to each status and add labels per store view. Can the returns be made payable? 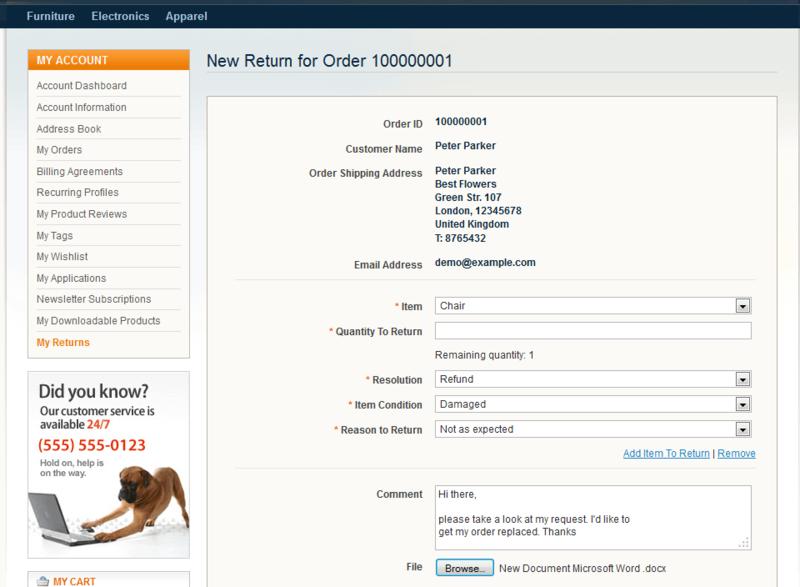 Payable product return can be achieved with some customizations. Please, contact us if you need this option. I had some minor issues with installation. In other aspects - a must have solution for each store running rma. This module is my right hand while the RMA process managing. Exceptionally good experience. And the support is commendable. The ext is good, works correctly. But I had to wait for some months to fully use it. 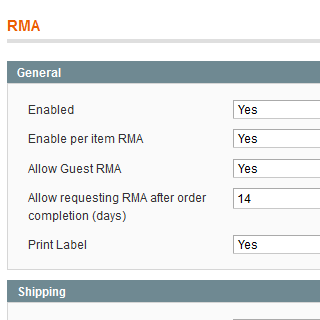 As there are lots of configurable products in my store, I often need to block rma requests creation to some of them. When I realized that there’s no such funtionality in the mod, I was a bit confused an’ nervous. My first thought was that I have to look for another one. I turned back to support for them to do smth w/t that, an' they told me they'd add the feature. 4 stars only for my lost nerves and waiting time. Faced no problems with installation. No errors or conflicts! Then, faced no problems using it. Many features to use and a helpful user guide. Wanna say thanks to Amasty team! Keep up going, guys! It is good to use, easy and has many functions. This module should to have every store. Easy for us, easy for customers. This mod is simple to configure and works stably. All I wanto to say is that it has all that I need. I was really puzzled when I didn’t find this functionality among native Magento features. So, I had to look for the 3d party plugin to bridge this gap. RMA by amasty impressed me with its flexibility and numerous options. Although not all of the features were easy to set up and not all of them worked as I expected, I’d give 4 stars to this app as everything that was missed by the tool developers was instantly improved by customer care department. I’ve seen some free rma modules that offer similar functionality, but having dug a bit dipper I’ve realized how much the functionality differs, and of course the support is a cherry on top of the cake. I do recommend the module to any merchant dealing with numerous product returns. I think this extension is a must have when you are dealing with returns and exchanges in your store and you’re taking your business seriously. We have a large clothing online shop and we do our best to provide our customers with an excellent service. That’s why we have to efficiently manage RMA requests process. After module installation we managed to dramatically reduce calls with return requests into our office and cut errors amount by a half thanks to fully automatic return procedure. We use the module about a year and didn’t have any issues with it. I think Amasty will be a first company where I will go in case I need more extensions for my store. Great work guys, keep it up! We’ve chosen this module among dozen s of similar plugins as it supports rma for guest visitors. This was exactly what we needed as customers often neglect registration and prefer making fast purchases. As soon as we sell footwear we face numerous rma requests every day. This extension allowed our admins to rapidly process the requests by keeping all necessary info at hand. Since we installed the module 5 months ago we haven’t noticed any inaccuracies or bugs. 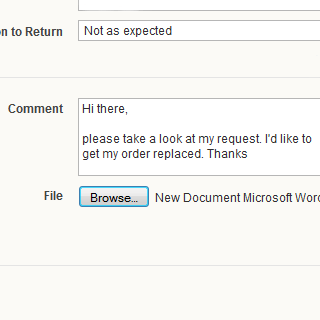 It was a great plus when Amasty added admin email notifications feature to keep track of all newly-made requests. I’m pretty sure this is one of our best buys so far. Keep on codin’ Amasty! You know it appears to be a wonderful tool for our RMA department. As we are running a huge store with tons of various items we need a quality system to operate customer requests. The RMA tool seems to be the best solution, and haven't found any bugs or issues yet!